London has the highest proportion of people in poverty, as well as parts of Outer North London, tracing the outline of the Lea Valley. higher poverty rates exist just south of the river in central and east London, and in the Outer West. Parts of the Inner West such as the north part of Kensington & Chelsea and Westminster also have pockets of high poverty. This map shows poverty rate estimates (after housing costs) for areas known as middle-layer super output areas (MSOAs). These are relatively small areas with a population of around 7,500. These statistics are experimental and so should be considered as indicative rather than definitive, but reveal interesting trends. The first is how much of London has poverty rates above the rest of England average of 21%. Only areas at the edge of London south, east and northwest are below this figure. The second is the concentration of poverty in traditional areas such as in Tower Hamlets, Hackney and Newham. Although this series of reports has documented poverty shifting out of Inner London, the most concentrated areas of high poverty are still there and in the north east. There are also noticeable pockets of high poverty rates in areas of west London, such as in Brent and the north ends of Kensington & Chelsea and Westminster. 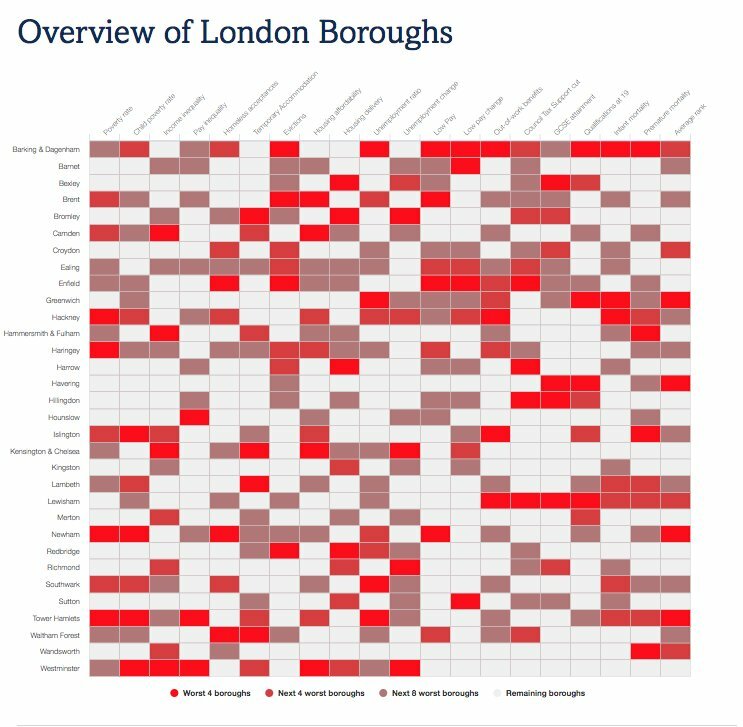 Only six MSOAs have a poverty rate below 10% in London, all in Outer London boroughs. At the other end, nine MSOAs have a poverty rate above 45%. 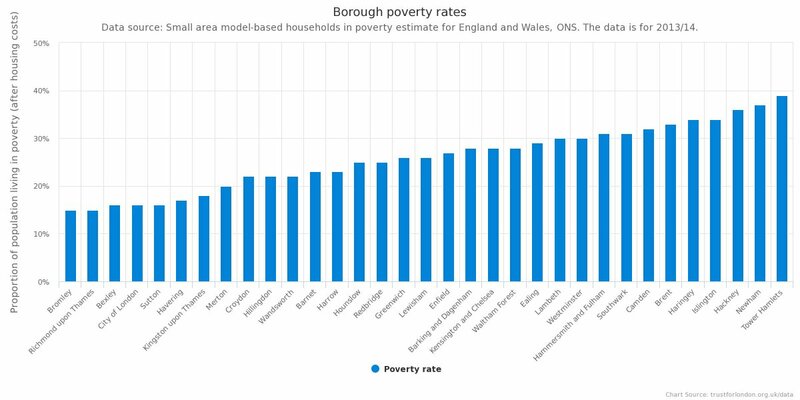 Most boroughs have areas that span either side of the average London poverty rate: only three boroughs have no area with a poverty rate above 28%, and only Hackney and Newham have no area below 28%. The data behind the map is available to download below.